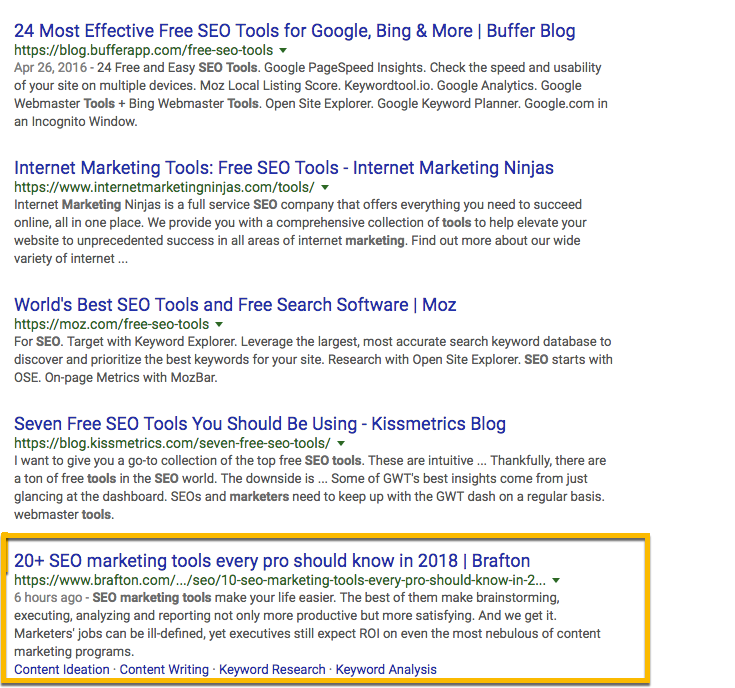 Within 24 minutes of republishing an existing blog, our keyword ranking jumped from 10th to 7th. By the end of the day we were ranking 5th. Yeah, content depth matters, and Google’s algorithm is THAT fast. Let’s back up and add a little context. 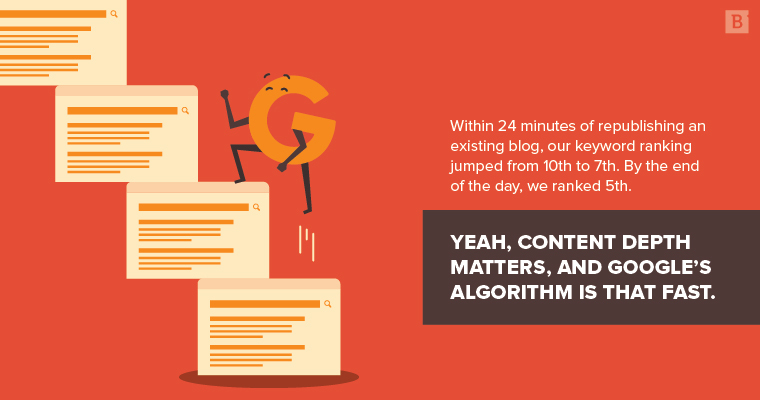 We’ve recently taken on a science experiment to test how much Google’s algorithm weighs “content depth.” In layman’s terms, we are making existing blogs more comprehensive and tracking the keyword results after “improving” the content. We are not making changes to any metadata nor are we building links to these pages. We made changes only to the on-page content. 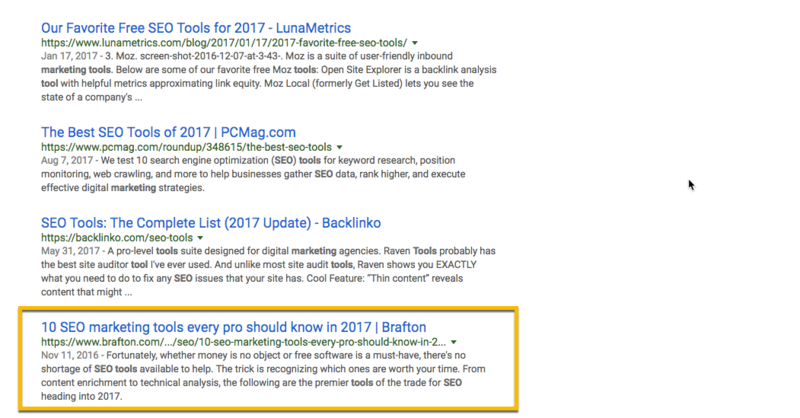 Among other articles, we selected 10 SEO Marketing Tools Every Pro Should Know in 2017. 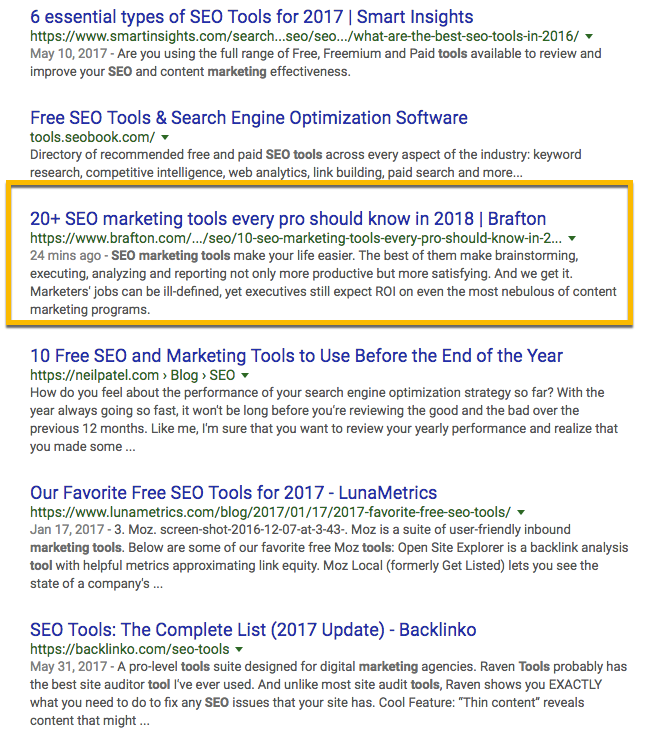 We chose this article because we were ranking in position 10 for the keyword “SEO marketing tools” and hypothesized that if we made the article more in-depth we would be able to increase our rankings and click-through rate. Using a tool called MarketMuse (which we have referenced in the past), we evaluated the competitive landscape of this keyword. 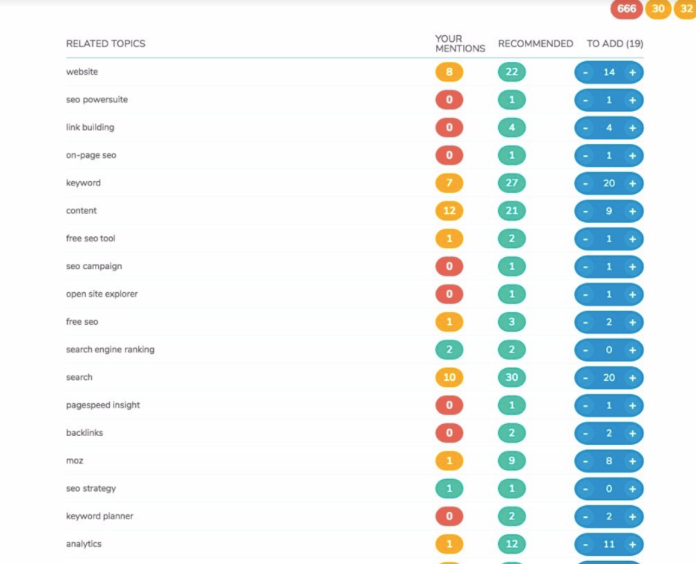 As a quick overview, MarketMuse uses artificial intelligence to compare your content against the top 20 pages that rank for any given keyword. It provides an outline of all the major topics discussed by the competitors, identifies your content’s gaps and produces a relative depth score. The output is a blueprint for how to create the most comprehensive piece of content on the keyword you are targeting. Our content was very much middling. It wasn’t great, it wasn’t poor; it belonged in the 10th position. But how do you add “depth” to a piece of content? Is there a scientific process to this, or do you just start writing? Fortunately, MarketMuse provides a gap analysis for your content relative to competitors. The output is a list of all the main topics the top-ranking sites that rank for your keyword are discussing in their pages. This is a roadmap for how to create content capable of out-performing everyone else. One might be tempted to simply add the missing relevant topics as keywords into the blog post and call it a day. This would be a mistake. The idea here is to discuss each topic rather than stuff keywords into the content. Each topic should have its own blurb speaking on its relevance to the article. After addressing our content gaps and thus rewriting the piece, the length of our piece increased to 2,125. We then republished. Dec. 12 at 9:00 a.m. PST: We updated our content. We ranked position 10 for the keyword “SEO marketing tools.” I immediately ran a Fetch as Google. Dec. 12 at 9:24 a.m. PST: Twenty-four minutes later our new content was indexed and ranking number 7. Dec. 12th at 3:30 p.m. PST: Our article was ranking 5, and the SERP was displaying shortlinks. To summarize: We updated an existing blog for content depth alone by addressing the content gaps in our blog and adding relevant topics to the piece. After updating the blog, we republished, fetched as Google and saw our position increase from 10th to 5th within eight hours. On a daily basis, our ranking ranges anywhere from 5 to 8 and never as low as our previous ranking of 10. At this point, a few things should jump out at you. First, the speed at which Google’s algorithm evaluates a piece of content. Second, the strong evidence that Google’s algorithm weighs content depth and topic coverage very heavily. Assumption 1: Google catalogs topic requirements for keyword search rankings, resulting in immediate feedback. The speed at which Google updated our results after reindexing can only mean that it had an existing understanding of the topics and depth of the ranking web pages for our keyword. It’s as if we plugged our new content into an existing model and Google told us how we mapped to that model. It was like our content was ran through a Scantron. Google understood which topics were important to that keyword based on other ranking web pages and rewarded us when we did a better job of addressing the topics we were missing. Google used to know only what you told it about a web page, usually through metadata. However, it has advanced to the point where it can determine for itself what a page is about and how well it satisfies the intent of a searcher. By updating the depth of our content (and ONLY the depth of our content) on an existing page, we isolated against all other ranking factors. The results indicate that content depth is a ranking factor and is heavily weighted. Have an opinion on this case study? Please feel free to comment or send us a note.